How can I help older people in hospital get home sooner and prevent deconditioning? Concerns about the complications of prolonged bed rest were raised as far back as 1947 (Asher 1947). Hospital stays are associated with iatrogenic infections, medication errors, increased risk of delirium and side effects of prolonged bed rest (Inouye and Charpentier 1996, Covinsky et al 2011). Healthy older adults who had ten days of enforced bed rest experienced substantial loss of lower extremity strength, power and aerobic capacity (Kortebein et al 2008). These losses may mean the difference between being able to get out of a chair independently or not; they have a significant effect on whether older patients are able to return home. Once patients are admitted to hospital it can sometimes feel they are ‘stuck’ there, despite everyone’s best efforts. The red to green campaign (#Red2Green), originated by Ian Sturgess in 2007, aims to identify delays (red days) in the hospital system and implement solutions to remove them, resulting in quicker discharge (Gordon 2016). The focus on removing delays is particularly important for patients in their last 1,000 days of life; time is valuable for these people and how and where they spend each day is crucial (Dolan and Holt 2017). Most acute hospitals have implemented the red to green approach, but if yours has yet to do so, consider looking into it. 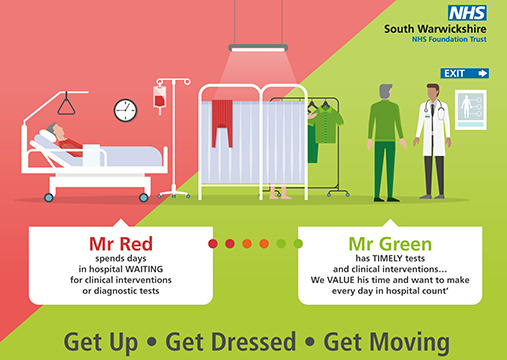 Following on from the red to green campaign, Brian Dolan launched the #EndPJparalysis campaign to encourage hospital patients to get up, get dressed and get moving to speed recovery and reduce length of stay (Dolan and Holt 2017). Consider setting up or getting involved in your trust’s #EndPJparalysis campaign. Staff, patient and public engagement is vital for its success. A variety of approaches have been undertaken to raise awareness of the campaign including posters and staff wearing their pyjamas for the day instead of their uniform. Establish what patients were able to do before admission and, if there has been a significant change, refer them to the physiotherapist and/or occupational therapist (Covinsky et al 2011). Ensure that you have a range of chairs that enable most patients to sit out of bed, even those with impaired sitting balance. Ask patients’ next of kin to bring in well-fitting day shoes, clothes and toiletries. Encourage patients to eat and drink. This helps to ensure they avoid dehydration and have enough energy to get up and walk about. Try to avoid using the commode at the bedside unless essential. If patients are unable to walk to the toilet, wheel them to it and encourage them to walk back. Encourage patients to be dressed during the daytime, accepting that some will prefer to remain in nightclothes. Encourage patients to perform any exercises the physiotherapist has given them. If you work in a care home consider implementing a red bag scheme in your local area. Developed in partnership with Epsom and St Helier University Hospitals NHS Trust, Sutton and Merton Community Services, London Ambulance Service and staff from Sutton care homes, the red bag contains essential items for residents who are admitted to hospital, such as information about medical conditions, medication, clothes, glasses, hearing aids and dentures. It stays with patients while they are in hospital and returns with them to the care home. If you are caring for a person living at home, it may be useful to keep a hospital bag packed and ready to go with well-fitting day shoes, clothes, toiletries and next of kin contact details. Asher R (1947) The dangers of going to bed. British Medical Journal. 2, 4536, 967. Covinsky K, Pierluissi E, Johnston C (2011) Hospitalization-associated disability: ‘She was probably able to ambulate, but I’m not sure’. JAMA. 306, 16, 1782-1793. Dolan B, Holt L (2017) Last 1000 days. Gordon P (2016) ECIP Quick Guide – Red and Green Days (Dr Ian Sturgess). Inouye S, Charpentier P (1996) Precipitating factors for delirium in hospitalized elderly persons. Predictive model and interrelationship with baseline vulnerability. JAMA. 275, 11, 852-857. Kortebein P, Symons T, Ferrando A et al (2008) Functional impact of 10 days of bed rest in healthy older adults. The Journals of Gerontology. Series A, Biological Sciences and Medical Sciences. 63, 10, 1076-1081.